The subtitle for Code Unknown is Incomplete Tales of Several Journeys, which unwittingly perfectly summarizes the film itself. Michael Haneke's (The Castle, Funny Games) intent was to demonstrate how complex life is, and how everything certain things affect other things. Instead, the movie comes across as obtuse, glancing into the lives of various people without anything meaningful coming out of it. There are five main stories, and none has any real resolution, some of them have no real point. It seems like Haneke is trying to tell the audience something, but it's not clear to anybody what this message is. With no discernible plot, the nearly two-hour running time seems even longer. 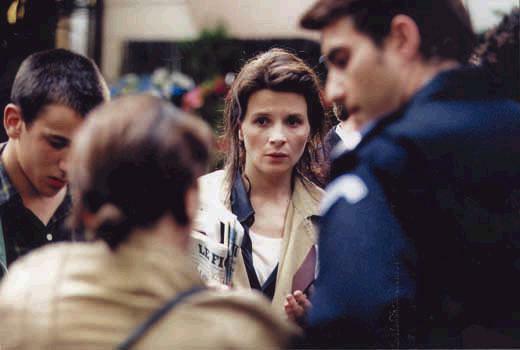 Anne (Juliette Binoche, The Widow of St. Pierre, Chocolat) is an aspiring actress. Her boyfriend Georges (Thierry Neuvic, Les Insoumis) is a news photographer who is working in Kosovo. Because of his job, the two cannot spend as much time together as they want, which is causing some strife in their relationship. Georges' brother Jean (Alexandre Hamidi, The Nest) wants to strike it out on his own. His father works on a farm and wants Jean to take over the business, but Jean wants something different. Anne, Georges, and Jean are the white French characters in Code Unknown. They are ordinary people trying to live their lives amidst any problems they may have. The other main characters are not white. Amadou (Ona Lu Yenke, Frontieres) is an African immigrant who teaches at a school for the deaf that his sister attends. Amadou is the character with the most life. He is headstrong and opinionated, and limited by the prejudice that people have against him. This often forms a chip on his shoulder, so that it feels like he sometimes infers racism where there is none. At the beginning of the film, he has an encounter with Jean. The police let Jean go, but force Amadou to go with them to the station. There is a story about Amadou's father and sister, but like most other things in Code Unknown, Haneke does not go anywhere with it. The last character is Maria (Luminita Gheorghiu, Train of Life, Too Late), a Romanian immigrant. She travels to France for a better life, but ends up begging on the street. The government deports her, but she realizes that life in France still may be better than life in Romania. The acting, especially by Binoche and Yenke, is strong. However, because of the episodic nature of Code Unknown, the movie feels more like an acting exercise than a movie itself. 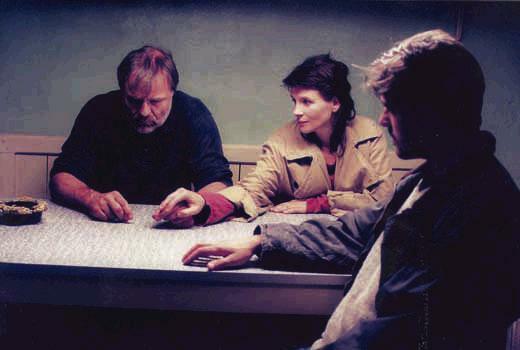 Haneke actually lets the viewer accompany Anne on auditions, rehearsals, and even post production. The other actors get the chance to ply their trade in various situations. Each time Haneke switches stories he does a quick fade to black before going to the next scene. There is an undercurrent of sadness and resignation in many of these stories. Try as they might, the characters are subject to things greater than their own will. Just like the audience. Mongoose Rates It: Pretty Bad. 1 hour, 58 minutes, French and Romanian with English subtitles, Not Rated but contains some mature thematic elements, most likely at PG-13.